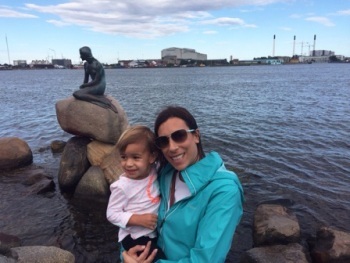 What a great place to start seeing Copenhagen - at the Little Mermaid - with our girls! Maddie liked the cannons and windmill at the Kastellet. Grandpa and Madeline had fun under the Kissing Bridge on our Netto-Badene canal cruise. Of course, every two year old would order Croque Monsieur (cheese and duck confit sandwich) with green beans and duck fat french fries. She loved it! Who cares if it's cold and raining outside in Portree, Scotland? We have a pool and hot tub! back-to-school uniforms at Marks & Spencers. the gardens or St. Patrick's Cathedral? Tiffany and Maddie decided to go inside, even though there was a playground inside the gardens. We ate lunch at The Temple Bar, established in 1840. Tiffany & Dad enjoyed a Guinness and we all shared an Irish charcuterie board and hot pastrami sandwiches. The best part of our stay in Liverpool, England was getting together with old friends- Mike, Ann & Eric - who all traveled for hours to be with us and share a pint and a Pimms. It was a cold, rainy day in Greenock, Scotland; but the Justice of the Peace Courthouse was still impressive. We were watching CNN talking about military maneuvers near Northern Scotland. Soon, there was real excitment on board when we saw Blackhawk helicopters, fighter jets and an aircraft carrier near our ship. We remained dead in the water while this battleship did a 360° circle around us and we sounded our big fog horn in salute. We had a beautiful day in Edinburgh, Scotland. Maddie & Grandpa played on the grass overlooking the castle of the great city. She was really interested in the bagpiper as he was setting up; but when he started, this was her reaction. We had lunch in an open air cafe, The Last Drop, just a block from Edinburgh Castle. Paul drank a Scottish ale and we all had haggis sausages with tatties (mashed potatoes). Maddie loved sitting on the top floor of the double decker bus as we drove through the city. 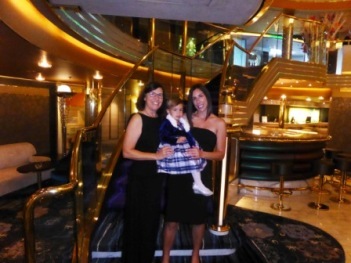 The girls were dressed up and ready to party for formal night. Maddie didn't like the troll she met in Kristiansund, Norway. She would look at him, but wouldn't get close. She did like looking at all the crabs, lobsters and other sea creatures in the Fish Market tanks. Look what I just picked! A flower from the Botanical Garden in Copenhagen, Denmark. Time for a rest near the rock garden hill. Maddie couldn't understand why we didn't go in to meet the Queen at Amalienborg Palace. We had to let her know that the queen wasn't home.